N.B. See my February 12, 2017 blog for a break in the case. 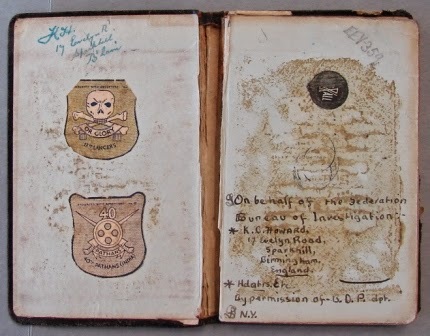 In addition to the 1936 diary, the Birmingham Police sent a small black notebook to MI5. The envelope noted "One diary and one notebook containing suspicious entries. See B'ham City Police report dated 5th June 1941". The cover note that accompanied the notebook through the corridors of MI5 read the same. the blue 1936 diary of Kenneth C. Howard. The little notebook was about the same size as the diary and quite worn. Within its pages, there was evidence of adult handwriting and of child handwriting. The inside cover displayed examples of both types of handwriting. A couple of stickers from British regiments were stuck to one side of the inside cover - the 17th Lancers and the 40th Pathans (India). The other side stated: "On behalf of the Federation Bureau of Investigation", clearly a child's mishearing of the American "Federal Bureau of Investigation". The child named Kenneth C. Howard imagined that he was a member of the FBI and played at being an investigator. The inside cover of the small black notebook. Near the end of the notebook were several pages which gave a Table of Contents for the notebook. The contents list of the small black notebook. Items included a list of Members of the Police Force, the Hebrew alphabet, Foreign Coinage and Aircraft Registration numbers. 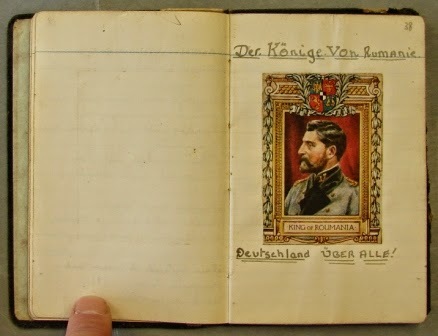 Page 38 was labeled "Der Könige von Rumanie", with a picture of the King of Romania. Beneath the image were the words "Deutschland über Alle!". Although apparently written in German neither phrase is grammatically correct German, and was clearly not written by someone familiar with the German language. A page with a picture of the King of Romania from the small black notebook. This particular page was placed on display at the National Archives Curator's Museum as part of a display on Josef Jakobs several years ago. It's connection with Josef Jakobs, however, is questionable. The notebook and 1936 diary were never included in any list of Josef's possessions but were sent to MI5 from the Birmingham City Police. The interrogation reports of Josef Jakobs make no mention of the notebooks or Kenneth C. Howard. The only espionage connection associated with Kenneth C. Howard and his notebooks was the reference to Karl Theodore Drücke. Given the other examples of Josef's handwriting contained within the MI5 files, it was also clear that none of the handwriting in either the 1936 diary or the black notebook belonged to him. The notebook and the diary have absolutely no connection with Josef Jakobs and were presumably misfiled at some point. National Archives, Security Service files on Josef Jakobs - KV 2/27.